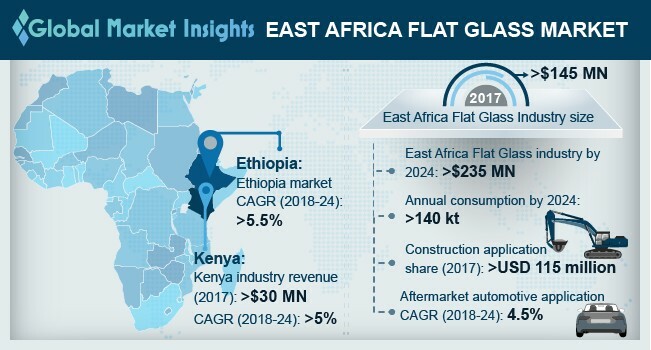 East Africa Flat Glass Market size is set to surpass USD 235 million by 2024; according to a new research report by Global Market Insights, Inc. Rapid growth in middle-class population is increasing the demand for infrastructure upgradation and energy & power in Kenya, Ethiopia and Tanzania. Rapid urbanization, population rise and economic liberalization in Tanzania is creating growth opportunities for East Africa flat glass market share in glass railings, floorings, aquariums, and security glazing for its shatterproof property, glare reduction, improved privacy and clarity. Uganda flat glass market demand from automotive applications may expect growth at over 3.5% by 2024 owing to its superior properties such as breakage into tiny fragments thus reducing the injury risks to passengers. Rising requirements for heat-insulating glass in vehicles and increasing automotive assembly and export business may stimulate the product demand. additionally, these products provide superior properties such as absorbing infrared rays from sunlight, thus reducing the amount of heat in the vehicle and shielding interior trims from ultraviolet radiation, which increases comfort. These products prevent exposure from harmful UV rays which are capable of serious skin problems. Kenya flat glass market size may expect gains at over 5% by the end of projected timeframe on account of the rising number of public construction projects driven by government spending apart from residential and mixed-use development projects driven by population rise. Increasing modernization trend along with rising consumer demand for stylish interiors may substantially affect the flat glass demand in the country. Residential product applications include windows, internal partitions, doors and mirrors primarily owing to higher strength, energy efficiency, aesthetic appeal and improved privacy. Silica sand, sodium oxide, calcium oxide, dolomite and feldspar are the major ingredients required in the manufacturing process. The dependence on product import rather than flat glass production with technological limitations may hamper East Africa flat glass market profitability. Tanzania flat tempered glass market size may expect consumption at over 12 kilo tons by the end of forecast period. Rapid growth in the automotive sector owing to improved trade, foreign investment, low duties and rising re-exports are likely to boost East Africa flat glass market size in the region. Tanzania vehicle sales were nearly 5,500 units in 2016, driven by improved cash availability, rising disposable income and convenient loan facilities indicating ample growth potential for the market. Rwanda basic float glass market demand may witness an estimated growth at approximately 4.2% till 2024, driven by increasing demand for windows from domestic housing sector, and glazed exterior surfaces in commercial buildings. The product allows high degree of light transmission, production in different colors, opacities, and chemical resistance which is expected to boost East Africa flat glass industry demand. Automotive segment could increase significantly on account of growth in tinted, solar control, and privacy glazing glass demand. Impala, Saint-Gobain, Kings Manufacturers, Hebatullah, and Cadasp Tanzania are the prominent market participants in East Africa flat glass market. Manufacturers prefer to focus on technological advancements, new product development and understanding customer expectations to enhance their product offering thereby enhancing the East Africa flat glass market demand.